We all know what Barbeque Nation is known for – A meal which can go way beyond your appetite and still manage to give you something more in return to cheer about. 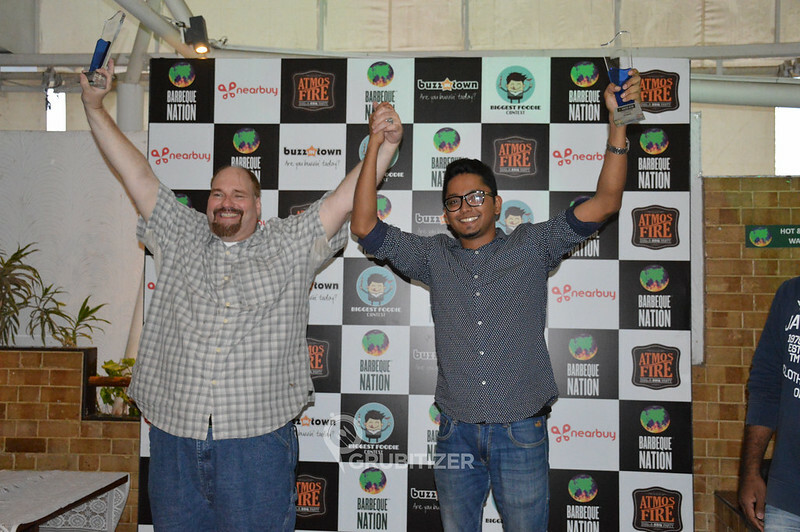 Barbeque Nation has always kept its patrons busy by constantly organizing food festivals and various events. 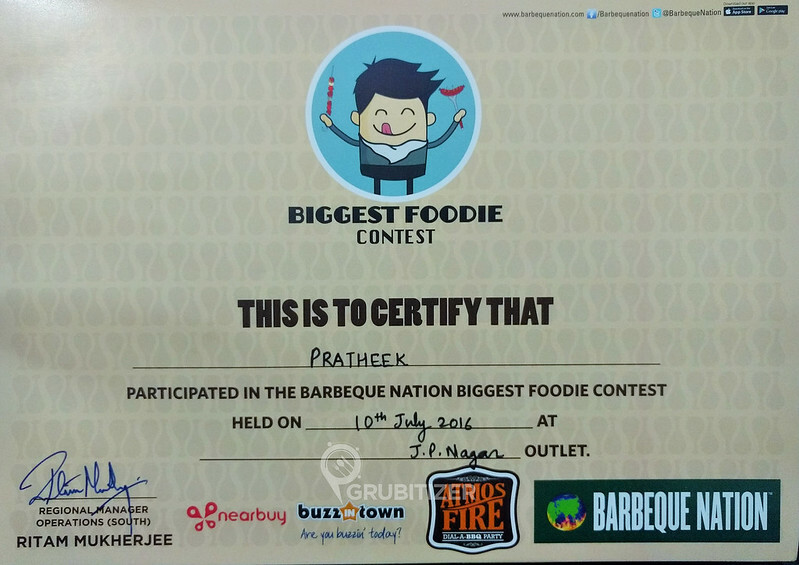 I was here for one such unique event in their JP Nagar outlet called The Biggest Foodie Contest which was sponsored by Nearbuy and BuzzInTown. 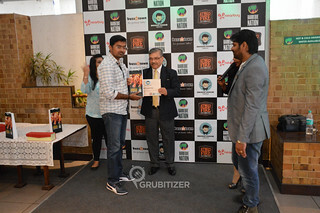 Barbeque Nation has pioneered D-I-Y (Do It Yourself) cuisine in India which follows the concept of live on-the-table-grill. This brand of restaurant offers a pre-fixed menu with a fixed price which is- the eat-all-you-can buffet. It covers a whole lot of cuisines like American, Mediterranean, Oriental and Indian in both vegetarian and non vegetarian choices. In short, you pay a fixed amount and then eat all you want with literally no restrictions! Coming back to this event, the rules are simple. You got to be aged between 20 to 40 years. 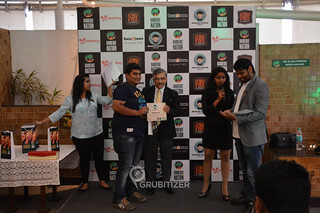 Contestants are allowed to drink water while gorging up the Barbeque platter. One interesting aspect about the rules is that you need to use only fork and knife to eat, Bare hands equals to disqualification. So the time allotted for this activity is 15 minutes and to become a winner you need to finish as many plates as possible in that time slot. Initially you have a set of 2 plates kept in front of you and a new one keeps coming in as and when you finish one plate, at the end the number of empty plates are counted to declare the winner. 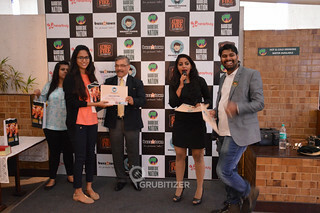 The winner, the Biggest Foodie gets a voucher worth Rs. 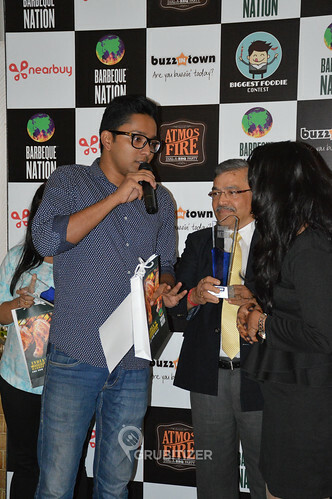 5,000 and a trophy from Barbeque Nation. Barbecue Nation celebrates your victory along with other folks by placing a life size cut out in their outlet for a period of one month. The event was scheduled to start at 4, which actually did happen and I was along with another friend and eventually got late by 30 min! 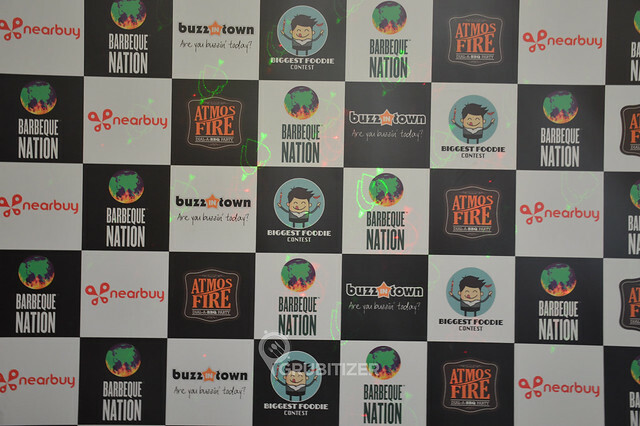 JP Nagar BBQ nation has a rooftop option as well and that’s where all had gathered. The stage was well set with the sponsors branding at the background and lots of camera all around, we realized it was something big! We were handed over the rules sheet with a declaration stating that we ain’t allergic to food being served and yes, we’re participating out of our own interest. Things started to get interesting when the first round started where around 9 participants started and the person who won ended up eating 4 plates of what you see below in the allocated time of 15 minutes. Next round was between us bloggers, usually known for their extremely large appetite 😛 We were given a time slot of 10 minutes. The show started after checking in on Facebook and letting our followers know that we participating in the biggest foodie contest! I began with Paneer Tikka which was expected to be soft. but it turned out to be extremely dry and this move backfired!! I spent a lot of time chewing and rolling the food that cost me a lot of time, and I ended up being the last person to finish my first plate. LOL! The winner of our bloggers round was Donovan who finished a little over 2 plates. Naveen Suresh was almost there as he completed 2 full plates. Third round saw a major players like Dale Boone, an American eating champion competing with other folks, and as expected he finished 5 plates in 15 minutes and ended up winning the Biggest Foodie Contest! 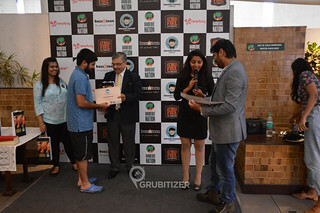 After a gap of sometime, the certificates were printed and handed over to all the participants. Donovan and Dale Boone were asked to pose for the cut out poster which would be placed in their outlet. 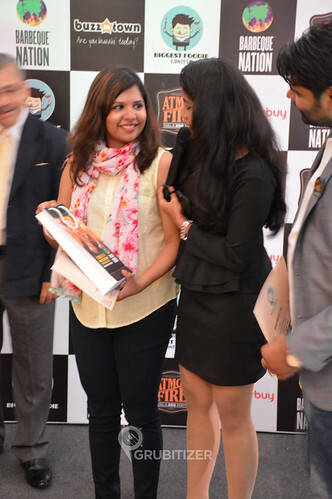 We all left with a goodie bag from Barbeque Nation and an awesome, one of a kind experience.